The 2016 annual Cardinal Kickoff will is February 24th at 6:30pm. 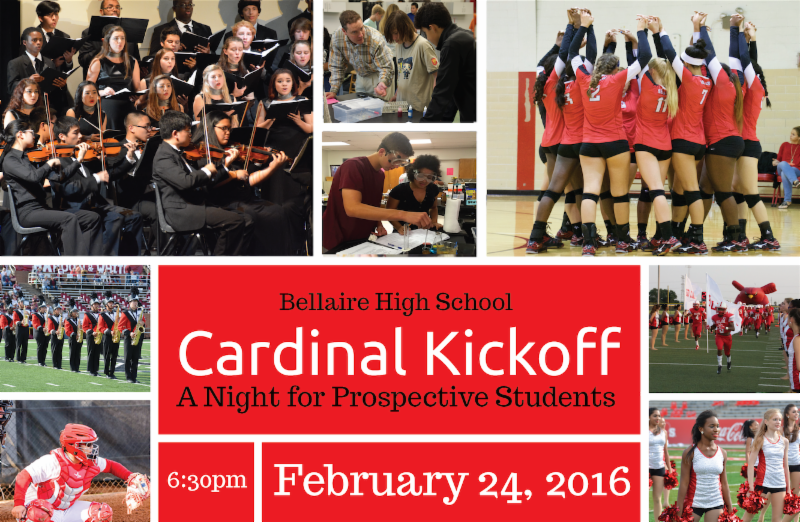 This is the "don't miss" event for prospective Bellaire High students to learn about the Cardinals. This event is a showcase of the many different school programs, athletics and student organizations at Bellaire High School. Volleyball fans, please reach out anyone you know who is considering attending Bellaire High. Coach Ap, Coach Martin and Coach Tomlinson will be on hand to answer any questions. - playing for Bellaire High and meet the coaches from all 13 UIL athletic teams and club sport teams. The Cardinal Kickoff will get you and your family connected with the rest of the Cardinal Class of 2020!